In that piece, I noted the differences in quality between the Perform Better kettlebells and the AKC kettlebells. It turns out, I did not know just how similar and how different they were. 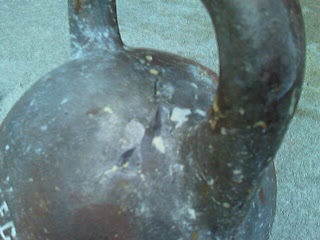 In a nutshell, the PB kettlebll I bought is an AKC kettlebell, made in the same mold, to inferior standards. End of story. I found out by accident. As I noted in the previous piece, the finish of the PB bell was of much poorer quality than the AKC bell, and the grey paint (epoxy?) 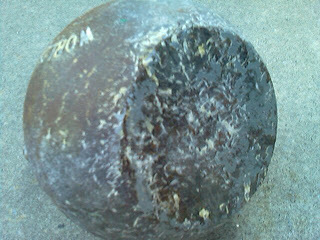 was continually chipping off when it collided with the AKC bell during clean and jerks. If the name looks familiar, it is that of Valery Fedorenko, the KB champion who works with the AKC. His name is on every AKC bell. The circular hole below his name is where the Perform Better logo appeared before I stripped it off. All AKC bells have "WorldKettlebell.Com" on the reverse side. As did this Perform Better kettlebell, when I stripped off the finish. What is the import of this information? Well, for the consumer, its obvious that the AKC bell is still the best buy. I had to spend a few hours to get the handle of my PB kettlebell smooth enough that it wouldn't pinch and tear my calluses. Once the finish started chipping off, I had to strip the rest off so it wouldn't scratch my shoulder raw every time I did long cycle or jerks. Now I'll need to sand it some more before its ready to re-finish. Let's just say that caring for the PB kb seems like it is a hobby unto itself. I will say that PB has prompt, courteous customer service, and I received the kettlebell promptly. But they had no interest in refunding my price when I explained how rough the handle was and how long it would take to dremmel and file it to be usable. They explained that removing the finish was a no-no. I smile when I think about that now. I have heard that the quality of PB kettlebells has improved, and if that is the case I'll provide an update and post new photos to verify it (if and when I receive any). In the mean time, I recommend the AKC bells as the best buy. 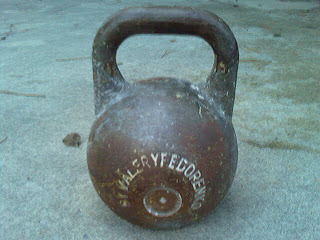 If you know of any other kettlebells you'd like me to post on, please let me know. Interesting. Probably, the foundry just puts inferior castings to the side and furnish them with a PB logo. I have some bells with the thick chippy color. Nice to watch, but as soon as first little chip has come off, there is no end... At the moment I find little green chips everywhere in my apartment :-). 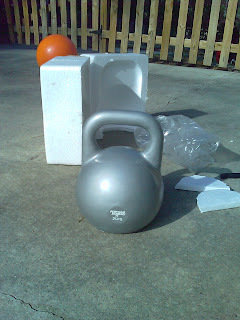 Yeah, my PB kettlebell looked great when i got it. But once the chipping started, like you said, there is no end. The PB paint job just isn't made for KB sport. The outward exterior gives you no clue to the real quality underneath. That was a quick lesson I learn when I stripped the handle (so it would hold chalk) and discovered how rough and unfinished the handle was. 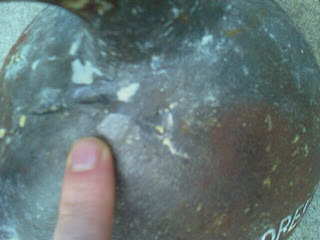 The ridges and valleys underneath the paint and bondo were horrible.